Beside the town wall lies the Old Town of Dubrovnik, which is a culture World Heritage since 1979. The UNESCO extended it in 1994. The Old Town of Dubrovnik is lying in the south of the town Dubrovnik. 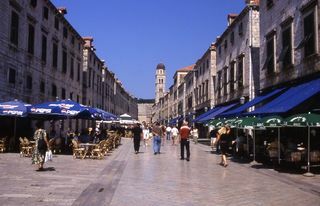 In front of the west gate of Pile you are found the central busstop of the Old City of Dubrovnik. You will come into through the Pile gate on the west side, Ploče gate on the east side or a gate in the north side of the town wall. In the year 1667 was an earthquake in Dubrovnik. The most beautiful sightseeing of the old city is the town wall with his Minčeta Tower and the main street Stradún between Pile gate and Old Harbour. Other sightseeings are beautiful Gothic, Renaissance and Baroque churches, monasteries, palaces and fountains. The fortress of Dubrovnik is constructed between the 12. and 17. century. At her you can walk around the City. The Pile gate has an outer and inner gate of town wall. Between both gates is showed a commemorative plaque about the damage by the aggression on Dubrovnik by the Yugoslav army in the years 1991/92. It was built in the southwest of the wall in 1464. It’s the greatest fortification of the wall. The Stradún is the main street between the inner gate of Pile and the Clock Tower on the other side of town. The croatian name is Sveti Spas. The croatian name is Sveti Vlaho. Here is the morning market place. The croatian name of the cathedral is Sveta Gospa. This article needs your support to be finished. If you know more about Old Town of Dubrovnik please add your knowledge to this article. On this page you can find more information of how you can contribute to this wiki.